Nintendo NES Cart. 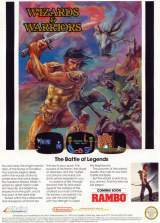 published 32 years ago by Acclaim Ent., Inc.
Wizards & Warriors © 1987 Acclaim Entertainment, Incorporated. You are Kuros, the knight warrior, hero of the Books of Excalibur. 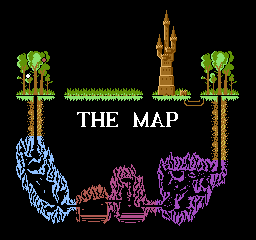 Your journey begins deep within the woods of Elrond, where even the wind obeys the Supreme Wizard, Malkil. A wizard so great, Merlin calls him teacher. But Malkil has strayed from the path, and is now part of the dark side. Buried within the catacombs and dungeons of Elrond lies the key to your quest. The powers of levitation, the cloak of darkness, and the mysterious potions only Kuros can drink will be revealed to you. In caverns of fire, through demons that fly and crawl, against the soldiers of the undead you must continue. No sorcery can prevail, for you are the only knight with the strength to wield the Brightsword. The prisoner of the wizard awaits. She calls to you from Castle IronSpire. But the wizard is watching you, warrior. And this tale has just begun. Released in December 1987 in the USA.